Downtown Wilkes-Barre’s renaissance is attracting national attention. Come see for yourself what all the excitement is about! Downtown Wilkes-Barre is Northeastern Pennsylvania’s largest concentrated employment center, with more than 13,000 people coming here to work each weekday. Downtown Wilkes-Barre is anchored by two four-year institutions of higher education ­ – Wilkes University and Kings College – with more than 7,500 students between the two downtown campuses. Downtown’s other educational institutions include Luzerne County Community College’s Corporate Learning Center, two high schools, and one private elementary school. 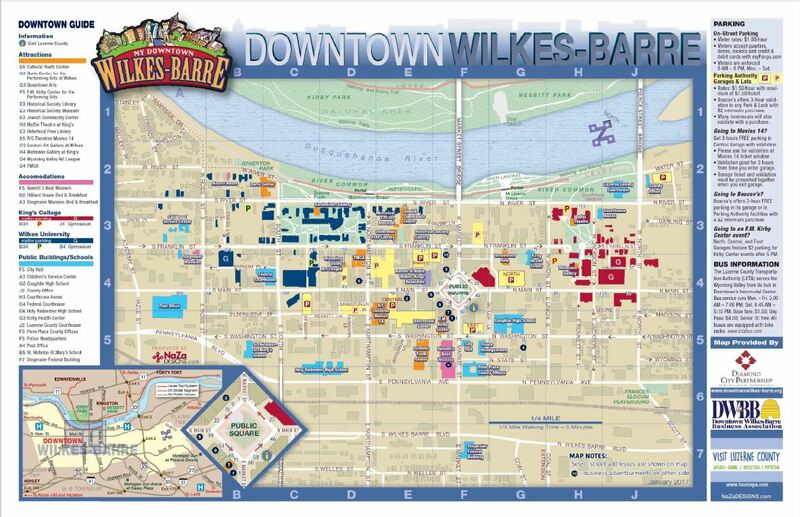 Downtown Wilkes-Barre is walkable! Our historic downtown is alive with an abundance of quality restaurants, shops, art venues, community amenities and more, all anchored by Barnes & Noble, Boscov’s Department Store, and R/C Theatres’ 14-screen multiplex cinema. Downtown Wilkes-Barre’s cultural lineup, anchored by the “F.M. Kirby Center for the Performing Arts, includes the Luzerne County Historical Society’s museum and library, the Sordoni Art Gallery of Wilkes University, the Widmann Art Gallery of King’s College, and many private art venues and galleries. Downtown Wilkes-Barre is Northeastern Pennsylvania’s premiere neighborhood for those seeking a “walk-to-everything” lifestyle – more than 3,500 residents already call Downtown home. To learn more about Downtown business opportunities, click here.